Recently I was looking through some very old sketch books and most of what I saw made me cringe - why was I storing so much of this junk? But I found a few drawings that I had forgotten about and was pleased to see again. This is one of them. It is a small pencil drawing made more dramatic by an inked background. The actual sketch is surrounded by several pen & ink doodles, which I edited out after I scanned it. 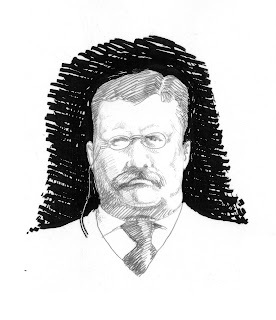 I remember at the time I was reading an outstanding biography of Roosevelt by Edmund Morris. Hmmm, you just got lucky then. As I was fishing through all of those old drawings, I decided it was time for many of them go into the "special" circular file, which will be picked up curbside by the nice man in the big truck.